Parenting milestone achieved – surviving our first family bout of gastro! 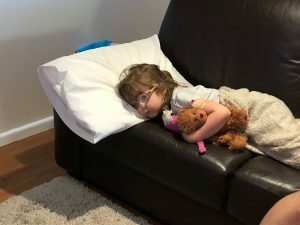 Last week, in addition to my daughter starting pre-school, we achieved another family milestone – our first bout of gastro through the household – and the experience got me thinking about change. When you’re in the throws of a gastro bug often all you can do is wait. Although you feel absolutely horrible, there’s some comfort in knowing that things will change and in 24-48 hours you’ll almost certainly feel much much better. All you have to do is simply survive (and try to maintain some humour and perspective). Similarly, in parenting, what I’ve learned 4 1/2 years in is that sometimes just waiting it out is just what you have to do to get through a period of discomfort, pain, frustration or suffering (whether that be related to sleep, toileting, eating etc). Often trying to initiate, force or speed up change is ineffective or just not worth the effort. It makes me wonder how often I’m getting stressed and trying to intervene and change something in other parts of my life, when I’m better off just having faith that the hard stuff will eventually end? But on the flip side, how often am I clinging to some hope that things will be different without making any (or sufficient) effort to bring that change into being??? In other news, I’ve taken my friend Summer’s recommendation and started using some bluetooth headphones (well, I’ve appropriated Jason’s AirPods) and am finding evening chores much less painful with a good podcast or audiobook to listen to. A few new podcasts that I’ve been enjoying over the last week or so are Women At Work from HBR, The Pineapple Project (which actually makes personal finance interesting), and Anecdotally Speaking (a business storytelling podcast). I read this article – Why We Forget Most of the Books We Read – and saved the link in my journal. A day or so later when reviewing my saved links, I couldn’t remember what the article was about, or why I thought it was important to save, which just kind of just proves its entire point! On re-reading, the key takeaway was acknowledging the difference between simply acquiring information and actual knowledge. Often I’m sucked into seeking out new information and the momentary experience of feeling like I’ve learned something, without actually learning. So one thing I’ve decided to do, instead of always focusing on the new article/book/podcast, is embracing re-reading and re-listening. This week I’ve relistened to Episode 1 of the brilliant 3-part Making Oprah podcast series (if you’re searching for it in your podcast app search for ‘Making Obama’ – the new series name), and I’ve just started re-reading Sarah Ferguson’s The Killing Season Uncut. So many life and leadership lessons from both (and plenty of #stickywisdom too) that I plan to blog about separately. Stephanie Coontz (a historian who studies family and marriage) has been popping up in my feeds in several places this week – in episode 2 of Women at Work on couples that work, on the most recent episode of Hidden Brain (When Did Marriage Become So Hard? ), and she also wrote this NYT opinion piece – For A Better Marriage, Act Like A Single Person. Date night always feels like enough of a logistical challenge to try and organise, but this article has inspired me to try and schedule in a few double dates this year! Finally, I’m really enjoying walking Ella to and from pre-school. It’s so nice to live within walking distance from the school and it’s great to have the opportunity to chat. Asking ‘how was your day?’ is a hard habit to break, but I’m trying hard to ask better questions that get her sharing more. This list gave me some good ideas to try.